I learned to row when I was very young, I've made four trans-Atlantic crossings on ships and been on many ferries, canoes, kayaks and other pleasure craft and still I have to think for a minute about which is port and which is starboard. And I'm hopeless on pintles, gudgeons, barbettes, tyes, nippers, skegs and baggywrinkles. Still I find boats, especially wooden boats, wonderful to look at. 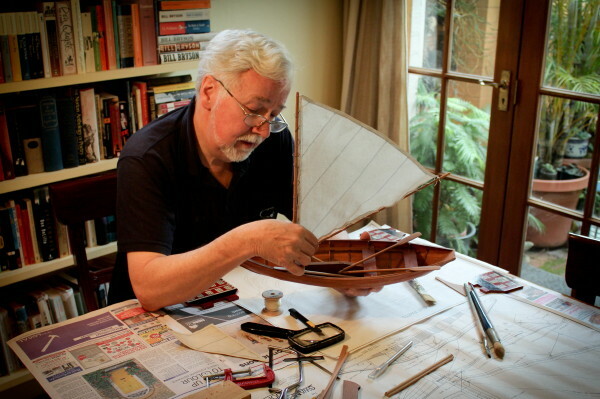 Confession: I'm a closet boat model maker. I've got one model that stays in the closet from year to year only to be dragged out when I'm particularly inspired to do so or just bored witless. Growing up in Boston, Massachusetts, I made lots of visits to the USS Constitution. 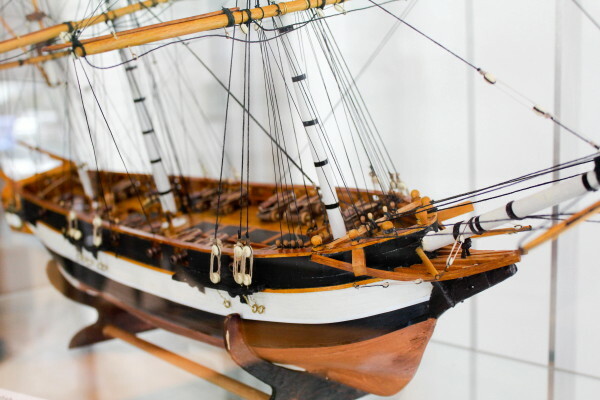 This ship was built in 1797 and named by America's first president, George Washington. It's still afloat, although with the normal replacement of weathered and rotting timbers over the past 215 years, very little of it is truly original. But it does look fantastic and is well worth a visit if you're ever in Boston. The Australian National Maritime Museum at Darling Harbour in Sydney is an easy walk from my house and I often drop in for a look, although not quite as often now that admission is no longer free. I know the permanent collection well but I keep coming back and back to see the ship models. One of the best models is of James Cook's ship HMS Endeavour (below) which brought him to Australia. Mapping Australia and New Zealand was a bit of a sideline on a trip which was to observe the transit of Venus in Tahiti. Note the blunt bow and the flattish bottom. 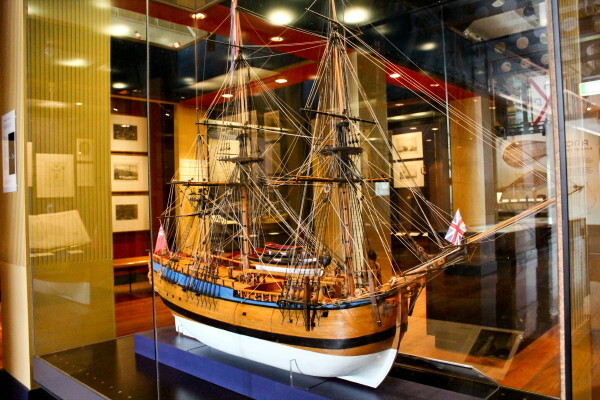 That's because HMS Endeavour was built as a coal carrier and formerly named Earl of Pembroke. 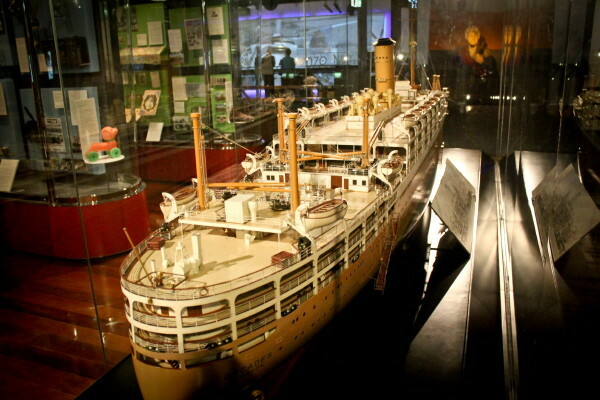 The thick hull surely saved it from breaking up when it ran aground on Australia's Great Barrier Reef. Later it was used to transport troops to the American Revolutionary War and was scuttled somewhere in Narragansett Bay, Rhode Island in 1778 while blockading the Bay. 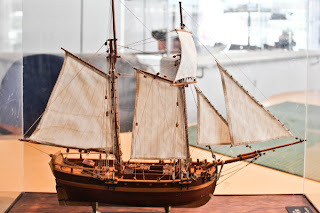 If you want to see a life-size replica of HMS Endeavour, there's one you can visit moored outside the Museum but I think I prefer the Lilliputian one. Probably the biggest ship model in the Museum is that of the Orcades II. Launched in 1937 it carried passengers to and from the U.K. and Australia till 1939. 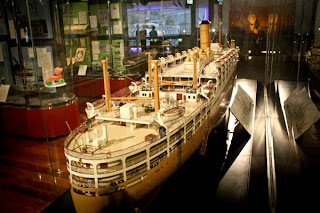 It was then used as a troop carrier during World War II but was torpedoed near Cape Town, South Africa, in 1942. The thing about models is the detail. 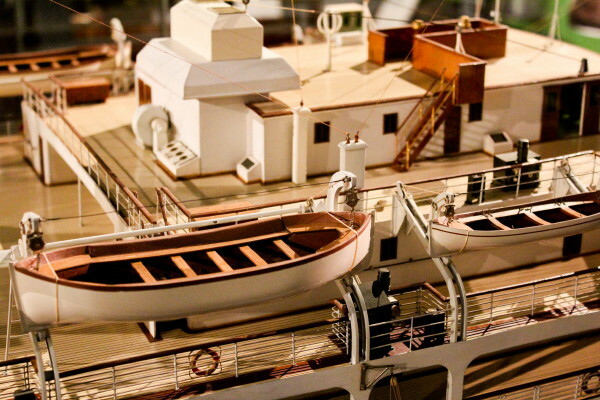 Could ship models be dolls houses for men? Surely not. One of the best exhibitions I've seen at the Australian National Maritime Museum was a collection of toy boats---Bateaux Jouets---from the Musée National de la Marine, Paris. 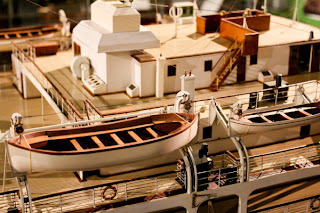 These weren't exact reproductions of boats but just wonderful little---and sometimes big---toys. I can't think of an equivalent kids' toy in today's internet world. While we're on the subject try to say "toy boat" over and over as quickly as you can. Why is it so hard to say? But back to bateaux jouets, Imagine a spoiled little rich boy in a sailor suit, perhaps Marcel Proust, searching for lost time while sailing the toy boat below in the Luxembourg Gardens in Paris. Bliss. 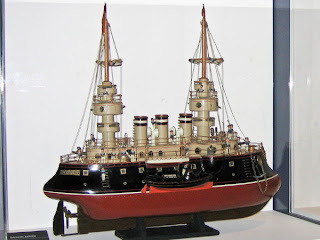 I'd have thought that ship and boat model making died out by now but on a recent visit to Hobbyco I found quite a few boat model kits. So I guess it's not dead yet. 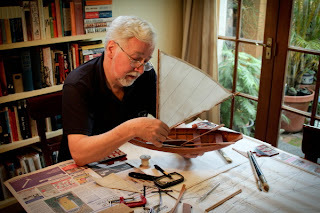 As for me, I've put away DSS Procrastination for the moment to do some writing but already I can feel the lure of the sea, the luff of sailcloth and the smell of superglue.